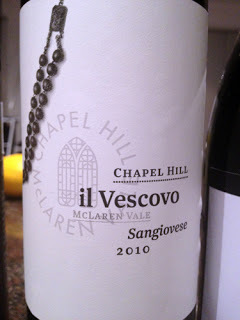 I find it interesting that Sangiovese has taken a hold in McLaren Vale. Is it an ideal climate for the variety I wonder? I mean McLaren Vale is hardly Chianti now is it? It’s not far off Maremma though (based on climate figures at least) which also begs the question about why we don’t see more Super Tuscan style Sangiovese blends in the Vale (they exist I realise that but they’re hardly prominent). To answer that question we can probably just look at this wine – a Sangiovese that smells of McLaren Vale first, Sangiovese second. I don’t mean that in a disrespectful way, more a nod to the strength of the regional character, much like what happens to Cabernet in the Hunter or Shiraz in Coonawarra. That being said this is a genuinely well made and yes, still varietal, wine that carries enough of the structural integrity that Sangiovese can bring to make for good drinking. Said nose is all tarry, slightly roasted red berries and a hint of mocha, all topped off with a bit of estery warmth. Noticeably clever oak on this, so integrated that it looks more like a coat of oak paint than an actual wine component which I think is a nod to the famously fastidious winemaking of Michael Fragos. The Sangiovese part of this wine comes through with a seam of black fruit – black fruit, new leather, a little whiff of sausage meat and pepper. The palate is intriguingly more varietal than the nose – or at least the tannins are – with a trademark sandiness to them that I quite like. They’re raw though, and some late alcohol heat does pinch the back end a little, Like ‘proper’ Sangiovese it is those tannins that drive this wine, pushing the savoury factor up a notch and giving this wine an extra degree of seriousness.